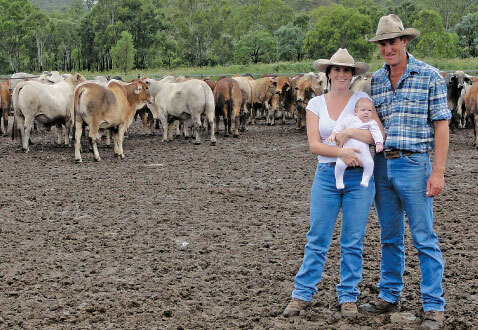 Alongside fiancé Jasmine O'Reilly, the couple assumed management of the operation in February 2010, working for owner and Brahman producers Eric and Lynne Slacksmith, Gladesvale Station, Richmond and Marcus and Shelly Curr, Yelvertoft Station, Mt Isa. Mr Slacksmith and Mr Curr invested in the feedlot in April 2006 with a view to having somewhere to value add their cattle during dry seasons. The cattle processed through the feedlot are from Mr Slacksmith's and Mr Curr's Northern and Western Queensland properties spreading from Mt Isa to Julia Creek and from Richmond down to Winton. The business also custom feeds cattle to boost turnover. There is no doubt Mr Slacksmith, Mr Curr and Mr Forest are all firm supporters of the Brahman breed, believing them to be the best value for money in the business. And that opinion is backed up by the success rate at Saxby. "It's Brahman country up here, especially for breeders," Mr Slacksmith said of their northern operations. "In terms of the feedlot, the Brahmans adapt well – we hardly ever lose beasts." The breed had the lowest maintenance requirements of any to be processed through the feedlot. "It doesn't get cold enough here that it worries them and we have minimal troubles with excessive heat load, and general management is easier," Mr Forest said. He added that very few cattle required medical treatment and most problems were "fixed with a bale of hay". "Some feedlots are incurring medical costs of up to $20 per head or averaging at $12. We average at about 70c per head," he said. An often forgotten statistic, but it can mean the difference between making a profit and a loss. Some feedlots operate with a margin of $30 per head, and excessive medical expenses could cancel out that margin. "The management before they get here is also really important. On those extensive places up north, like Eric and Marcus's, their management and husbandry has to be spot on. They have a time frame and it's scheduled and they get the job done," Mr Forest said. "We rarely see any northern cattle with horns. They have been dehorned which takes away from time lost in the feedlot. "Eric has some of the best Brahman cattle I've seen." turn provides sustainability of operation," he said. In regard to maximising profits, Mr Slacksmith said the Brahman breed certainly ticked the box. "They are efficient converters - they don't eat as much as a crossbred. And it gets back to dollars when you are feeding them." Mr Forest said in terms of market knowledge there were many producers with misconceptions about the breed. "There are a lot of producers who think that Brahmans don't grade into MSA grids. Brahman cattle consistently grade into MSA grids because MSA is a cuts based grading system, not a breed based system. "One thing that I think needs to be noted in some way is that many people go astray when feeding cattle because they think that feed and HGPs will make up for poor genetics. "Everything we can do and use are only aids to the animal. A solid genetic base provides a strong foundation." The Brahmans at Saxby have shown it is not just their hardiness that makes them a valuable breed. These conversion figures from the feedlot are calculated with actual dry matter content of the rations fed to the varying mobs to make the comparison as accurate as possible. Based on the above figures, the crossbred steers have a greater gross return due to the additional weight gain, giving a nett profit of 11% on capital invested. The Brahman steers have a lower gross return than the crossbred steers, but return 13% on capital invested, or 2% more profit, due to the lower cost of gain driven by lower feed consumption and better feed conversion.